The Ergonomic Kneeling Chair foregoes convention for a design that offers greater comfort. Spaced pads allow you to rest comfortably on your knees. Fabric options are available in both gray and blue. Tired of kneeling? Take a seat! 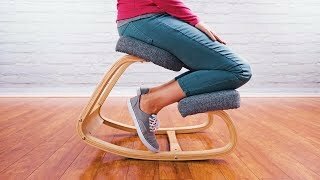 The Ergonomic Kneeling Chair doubles as a more standard stool. Work at the right height to avoid strain and pain during your workday. The Ergonomic Kneeling Chair lets you change up your posture and angle as you work. Start customizing the look of your own Ergonomic Kneeling Chair for an innovative seating experience. Why should I get a rocker type chair instead of one with regular casters? The ability to rock and move helps you stay alert and comfortable throughout the day, improving circulation and channeling restless energy. While casters only allow you to move the chair from place to place, the rocker allows you to get more motion at your desk, so you engage your core, improve posture, and even burn calories! What if I don't have a height-adjustable desk? Will the kneeling chair work with my desk height? The kneeling chair will allow you to sit and rock comfortably at most standard height desks. If you'd like to get more active, and be able to switch to more positions throughout your day, we recommend a sit-stand desk, which will accommodate kneeling, standing, perching, and sitting, as well as motion boards, treadmills, and bikes. Will the kneeling chair work on carpet? We've used the Ergonomic Kneeling Chair on our carpeted office floors, along with hard surfaces like wood and concrete, and it works great! Have your seat and knee cushions upholstered in your choice of color. You'll have your pick of blue or gray to match your office décor. Both options feature a durable, woven fabric and come with a stylish light wood base that will last you for years of healthy work.